ANN ARBOR, MICH. –University of Michigan football senior punter Will Hagerup (Milwaukee, Wis./Whitefish Bay) has been reinstated as an active member of the team, but will sit out the 2013 season, Wolverines head coach Brady Hoke announced today (Tuesday, May 7). Hagerup, who was suspended on Dec. 16, 2012, for a violation of team rules, is allowed to return for voluntary summer workouts and team functions. He will have one season of eligibility remaining in 2014. 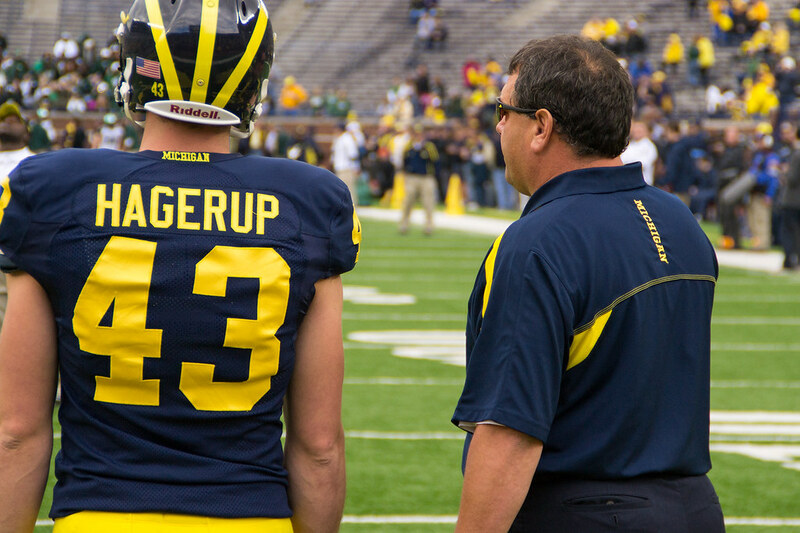 "Getting back around his teammates is an important step in this process," said Hoke. "Will and I have had several discussions over the past five months, none of which have been about football. Our primary concern has been for him as a person, and that will not change. Will is a part of our family, and we will continue to offer the resources to help him learn and grow. I am pleased with his progress to this point, and he knows that must continue every day moving forward." "The past five months have been an incredible, humbling time for me," said Hagerup. "I understand my actions represent every person that supports me, as well as any man who has worn a Michigan jersey the past 133 years. My dad always says that character is how you act when no one is watching. In retrospect, I needed to take a big step in the character department, and I’m excited in the progress I’ve made in the last five months. "This trial also has taught me a great deal about my faith, my family and friends, the athletic administration, the coaches and my teammates. I let down all of the aforementioned people, as well as the best fans in football. Before, I thought I could solve my issues by myself, but I was wrong. I now realize that I must and should rely on the important people in my life for guidance and support. "I want to thank Coach Hoke, Dave Brandon, Greg Harden and all of my teammates who have supported me and always made time for me in their busy schedules, even when it looked like I may not ever play here again. They have given me a new opportunity to become the Michigan Man I always wanted to be, and I plan on taking advantage of that second chance. That said, I realize everyone needs to see my actions, not simply hear about them." Probably the best way this situation could've resulted for Hags. He was on thin ice, so apparently, he's really turned it around with Hoke. We'll see if this ends up being a Darryl Stonum-like situation – who sat out the 2011 season before leaving the team a year later. My gut says no, Hoke won't let that happen.